In late December 2008, Israel launched a massive military attack against the Gaza Strip. Israel’s three-week action caused massive damage to homes, businesses, and infrastructure. It is too soon to know the full cost of the damage. But what we do know is that the attack came at a time when the Palestinians—on the West Bank and all the more so in Gaza—already faced dire economic circumstances. The 1993 Oslo accords appeared to signal a new prospect for peace and prosperity for Palestinians and Israelis. In fact, however, within a few years after the signing of the accords, social and economic indicators for the Palestinian community began to deteriorate sharply. Since the mid-1990s, Palestinian poverty, malnutrition, and unemployment rates have all risen dramatically while school enrollment rates have fallen—all signs of an economy in crisis. Pressure from business sectors that relied on cheap Palestinian labor at first led to periodic reversals of Israel’s closure policy. Eventually Israel began replacing Palestinian workers by opening its borders to international migration, with workers from as close as Lebanon and as far away as Mexico coming to work in the agricultural fields and service sectors. Although most come on temporary work permits, many stay after their visas expire, with the result that Israel now faces a growing problem of illegal migrants. An examination of labor-force survey data suggests that those who lost their jobs in Israel were primarily younger, less educated men. The Palestinian Authority has pursued Keynesian policies that attempt to stimulate the economy by expanding the government sector, but many of the jobs being created are for more educated Palestinians. Thus it is less-educated youth who suffer the highest levels of unemployment. In 2003, for example, young men had an official unemployment rate of 36.9%, which no doubt understates the problem since many additional Palestinians are either underemployed, working part-time but unable to find full-time work, or else so-called discouraged workers who have given up looking for work and so are not even counted as unemployed. The Boycott Divestment Sanctions (BDS) movement started in 2005, got a huge shot in the arm when Israel launched its latest attacks on Gaza. Workers, students, and academics, as well as well-known activists such as Naomi Klein and Adrienne Rich, began calling for a boycott of Israel in early 2009, in response to the recent attacks on Gaza. The concept of using economic pressure against Israel has been around for some time. As early as the 1936 Arab revolt, Palestinian leaders called on their community to boycott both the British and Jewish settler economies, in an effort to protest colonial occupation. During the first Intifada (1988 to 1993) one of the cornerstones of the Palestinian uprising was an economic boycott of the Israeli economy. The underground leadership urged Palestinians to boycott not only Israeli goods, but also work in Israel, although the latter was far more difficult to implement because of the high levels of dependency on the Israeli economy. The most recent effort, spearheaded by BDS, involves calls for three types of boycotts, divestment, and various forms of sanctions. Concerning the first, BDS includes both U.S.-based corporations such as Estee Lauder and Israeli companies such as Max Brenner chocolates on its list. They also call for a boycott of Israeli academic institutions, cultural groups (such as dance troupes) and sports teams. BDS is putting pressure on various governments, and also asking institutions such as churches and schools to join the divestment movement. The group claims a number of victories in this area, including the UK government�s decision to discontinue renting space in Tel Aviv from Lev Leviev (international diamond merchant and settlement builder), the withdrawal of a French company, Veolia, from a contract to build a light-rail system to service settlers, the decision of the Church of England to divest from Caterpillar, and the decision of Hampshire College to divest from U.S. companies that supply military equipment to Israel, including Motorola and General Electric. Since the recent attacks on Gaza, BDS had also identified a number of worker actions in solidarity with the Palestinians, including the decision by South African dockworkers to refuse to unload a ship carrying Israeli goods. Finally, the group calls for three types of sanctions, including at the state, regional and institutional level. The aim is particularly to pressure governments to end cooperative, military, and trade agreements with Israel. In addition to the direct loss of access to jobs in Israel, external and internal closure policies have undermined the Palestinian economy in other ways. During the period from 2000 to 2002 over 300 military checkpoints and roadblocks were in place in the West Bank, and over 25 in Gaza. By 2008 the roadblocks inside Gaza had been removed (following the Israeli withdrawal) but the number in the West Bank had risen to over 600. Roadblocks and checkpoints not only create massive economic inefficiencies, as individuals often have to wait in line for hours to pass through the checkpoints, but they also reduce economic interaction among Palestinian communities. As a result of these restrictions, Palestinian food products often rot before they can be sold. Women in labor are denied access to hospitals. Students cannot reach their schools, and workers find themselves cut off from their places of employment. Any trade between the Palestinians and the outside world has to go through Israeli checkpoints and border controls, giving Israel the often-exercised option to limit Palestinians’ ability to export goods and earn foreign exchange—and, more recently, to receive much-needed imports. Gaza has become particularly isolated, cut off not only from Israel but also from neighboring Egypt and from the West Bank. The World Bank estimates that per capita GDP in the Palestinian territories declined by 19% in 2002 alone, in large part due to internal and external closures. 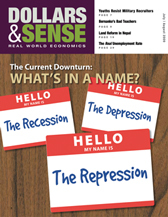 Whenever closure was imposed, unemployment rates skyrocketed, often reaching over 50%. As a result, poverty rates rose considerably, from 21% to 60%, between 2000 and 2003. By 2004 the U.N. reported that by some measures, poverty had risen to 67%. Not surprisingly both the poverty and closure policies have contributed to rising malnutrition rates. In 2002 a joint study by Johns Hopkins and Al-Quds University found that over 13% of children in Gaza were suffering from acute malnutrition, compared to the West Bank, where the rate was just over 4%. Although the Palestinians have experienced some periods of economic growth in recent years, in aggregate, between 2000 and 2007 Palestinians’ per capita GDP fell by a total of nearly 30%. More recent poverty rates indicate large differences between consumption-based and income-based measures, since aid now plays such a crucial role in keeping Palestinians out of poverty. In 2007 30.3% of Palestinian households were identified as poor based on consumption (19.1% in the West Bank and 51.8% in Gaza), while income-based measures suggested a poverty rate that was considerably higher: 57% for the West Bank and Gaza Strip combined, and close to 80% for Gaza. The consumption-based measures suggest some improvements in the poverty rates between 2004 and 2007, while the income-based measures reflect the fact that the ability of Palestinians to support themselves has not improved in recent years. Israel’s December attack thus came after a long period of economic isolation and deprivation in Gaza. The Palestinian Central Bureau for Statistics has released a preliminary estimate of the destruction of $1.4 billion. The United Nations, in addition to calling for hundreds of millions of dollars in short-term aid, has argued that $1.9 billion will be needed to rebuild Gaza. This includes rebuilding not only the 50-plus U.N. facilities that were hit, but also 21 medical facilities, 1,500 factories, and thousands of homes. Extensive funds will also be needed to rebuild infrastructure, such as roads and sewage lines. No price of course can be placed on the lost lives. As the World Bank pointed out in its assessment of the damage caused by Israel during its last major incursion into the Palestinian territories in 2002 (estimated at over $900 million), much of the damage to infrastructure involves projects funded by donors. In other words, foreign aid is used to build roads and schools, which are then destroyed by the Israeli military, sometimes soon after they are built. Restrictions on what can enter and leave Gaza have been in place for a number of years, but in the aftermath of last December’s incursion, the Israeli government has become even more draconian and unpredictable in terms of what it allows in, thus further increasing hardships. Basic food items as well as infrastructural components, many crucial to Palestinians’ well-being, are routinely prevented from entering. For example, Israel recently blocked a water purification system from France from entering Gaza. Restrictions on food items, such as pasta, carrots and kiwis, also illustrate ways in which the blockade is punitive rather than based on Israeli security needs. Gazans’ multifaceted dependency—due to their historic dependence on Israeli capital, their lack of control over their own borders, and their current dependency on aid—renders them extremely vulnerable to changes in Israeli policy and the attitudes of the international community. When the majority of Palestinians voted for Hamas, a number of donor countries refused to continue funding the Palestinian government, thus reducing the government’s ability to provide services and employment. And while Israel has argued that destroying the tunnels between Gaza and Egypt was necessary to cut off arms shipments, these tunnels have been indispensable for bringing goods into and out of Gaza, in a period where Gaza has been physically isolated by the Israeli military. Baby formula, flour, fuel, and even chocolates are among the items regularly smuggled into Gaza, with economist Omar Shaban arguing that two-thirds of all goods were entering Gaza through the tunnels even before December 2008. While the Israeli government claims the goal of the December war and the current blockade is to cripple Hamas, it is likely that Hamas’s popularity will be sustained or even increase, for both external and internal political reasons. Palestinians view Hamas as representing a rejection of the status-quo in a number of ways. Hamas leaders have openly pointed out the ways that Israeli policies are hypocritical, and the organization has gained a reputation for being far less corrupt and more efficient at running social services than Fatah. In addition, what many in the West do not realize is that Islamic theology carries a strong message of economic equality. This makes an Islamist party like Hamas all the more appealing to a population that has become increasingly impoverished in recent years. Jennifer C. Olmsted teaches economics and women’s studies at Drew University in Madison, NJ. Her current research examines the way conflict and economic isolation affect economic conditions and gender norms, often in contradictory ways, using Iran, Iraq and Palestine as case studies.